1. Heat the olive oil in a large saucepan. Add the onion and cook for 3–4 minutes then stir in the ginger and spices and cook for a further minute. 2. Tip in the cauliflower and potato and toss well to coat in the spices and onion mixture. Pour over the stock, cover and simmer for about 15 minutes until the vegetables are very tender. At this point the stock will have reduced by half. 3. Add the crème fraîche and mash, using either a potato masher or a fork, until you have a rough-textured creamy mash. 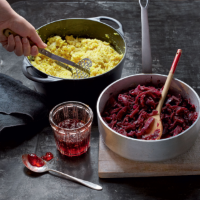 Serve this with Braised Red Cabbage With Apple alongside your Christmas turkey.